The winery was built by Charlie and Stu from stones and lumber from the property. A cellar and the main floor house French and American barrels. The roof of the building, with stunning 360-degree views, is used for entertaining. 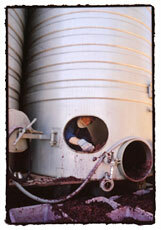 Smith-Madrone believes in the premise that great wine can only be made from grapes of superb quality. Grapes of this quality are the result of the right site, soil and weather, along with proper management. Since the first vintage in 1977, winemaking practices have been a blend of the traditional methods of France and Germany coupled with new techniques developed in California. Such winemaking processes as barrel fermentation, sur lie aging and open top fermentations require substantial amounts of hand labor but are essential to the production of wines of great quality. Less than 4,000 cases of wine are released each year, similar to Europe's small estate wineries. At Smith-Madrone our goal is to make artisanal wines which are distinctive and are an expression of both the vintage and us, as vintners, but above all else, are wines which bring pleasure to the senses. Every year our wine is made from the same vineyards, pruned by the same people in the same way, cultivated in exactly the same manner and harvested at similar levels of maturity, yet Mother Nature stamps each vintage with a unique set of flavors, senses and character. Vintage dating is a celebration of that uniqueness and diversity.